Our self-guided walking holiday in the Jura is a linear trail which follows the vines south, allowing you to discover not only the unique Jura wines, which include the famous Vin de Paille and Vin Jaune, among the most prized wines in France, but also wonderful historic villages such as Baumes-les-Messieurs and Chateau Chalon. These villages are situated on hills which are home to a series of dramatic valleys and gorges which harbour stunning waterfalls & dramatic cliffs. 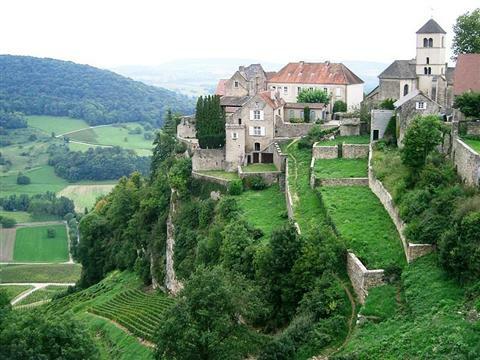 Lying to the north east of the Alps in France, the Jura form an impressive arc of undulating limestone hills. The western Jura is lined with a series of dramatic valleys and gorges which harbour medieval towns, stunning waterfalls and a patchwork of vines. The moderate walks explore these “reculée” from above and below, including the Hérisson valley which contains a breathtaking collection of 31 waterfalls in a 3km stretch. The Jura is a chain of folded limestone mountains stretching for about 300km along the border between France and Switzerland. It is 70km at its widest where a number of folded peaks and valleys exist on parallel. 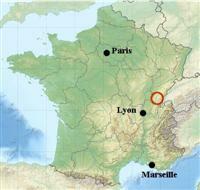 In France, it covers essentially the region of Franche-Comté, stretching south to the region of Rhone-Alpes east of the department of Ain, where the range reaches its peak at Le Crêt de la Neige at 1,720 meters (5,643 feet). The southern end of the French Jura is in the northwest of the department of Savoie. The north end is in the very south of Alsace. 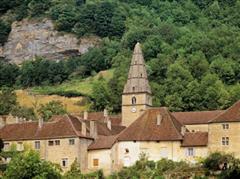 The Jura region of France changes in character from west to east. However, certain elements are common to the whole mountain chain such as the forest lined streams, the colour of the limestone cliffs, the narrow winding roads, the isolated and intimate valleys and the traditional villages. The forests of the Jura give the area its form and colour, as well as hosting important wildlife such as Lynx, Chamois and Cerf. The forest has also served as a catalyst for a number of traditional activities in the area such as the production of pipes and children’s toys. Today, the economy of the region has evolved, whilst still holding onto its traditions so that artists, artisans and industry alike use both new materials such as plastic alongside wood. The Jura is also known for the manufacture of fine precision articles such as clocks and glasses. There are a number of regions within the French Jura, and these can be assimilated into 3 distinct areas: the revermont, lakes and small mountainsand the Haut Jura. Our guided walking holiday will explore the first two. The western part of the French Jura emerging from the lowland lakeland region of Bresse is characterised by its vines, valleys and cliffs. Despite being a relatively small area , the wines produced in this region have a great diversity and it has the distinction of being the first wine region in France to be given an “origin label” in 1936. The other distinctive features of the Revermont landscape are the “reculées" or enclosed valleys, which form a world cut-off from the surrounding landscape. They are as impressive as they are interesting in terms of their unique features, with spectacular caves, beautiful waterfalls, amazing limestone formations and cliffs, as well as a rich flora and fauna. Historic picturesque villages have found refuge in these valleys or line their cliff tops in defensive positions. One of the most impressive valleys is Baume-les-Messieurs, which hosts one of the prettiest villages where an historic abbey is sited. 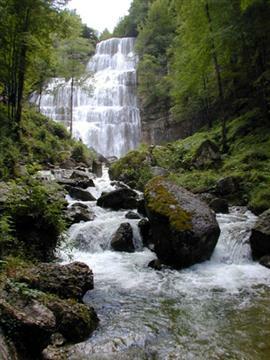 This intermediate zone between the wines and the high mountains is made up of a number of features, of which the most spectacular is the Herisson waterfall. A series of 31 waterfalls form an exceptional and unique site. The two most famous of the falls are the Eventail with its series of steps and the Grande Cascade which plunges 60m and offers the possibility of walking behind its foaming waters. Upstream from the falls is an area covered by a series of picturesque lakes. It has a varied wildlife including deer, wild boar, antelope, a range of orchids and the giant yellow gentian, whose roots are used to make liquor. Follow High Point Holidays's board Jura on Pinterest.